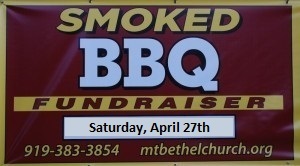 Al Myers and his team are hosting a Smoked BBQ Fundraiser Saturday, April 27th from Noon to 3 PM. Smoked BBQ pork, chicken and brisket will be available by the pound or by the plate; eat in or take out. We appreciate your pre-orders via the website: mtbethelchurch.org/smoked-bbq-fundraiser-spring-2019. Pre-orders close on Wednesday, April 24th.